Fleet Numerical (FNMOC) is a military base in the neighborhood which collects weather data and distributes it around the country for weatherpeople to use in their reports. The Monterey Fairgrounds has many activities throughout the year. To find out what events are coming up and to contact them, go to their web site. The North Fremont Business District is an organization representing many of the businesses adjacent to CONA. For an Emergency contact 911 but for non-emergency communications, please contact the Monterey Police using the contact information on their web page. 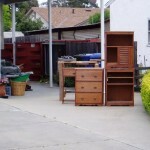 The 2011 CONA Neighborhood Cleaup project held on Saturday, June 18, 2011 was a big success, we filled up three packed large flatbed truck loads, two – thirty yard dumpers and a large truckload of hazardous waste from stuff placed on the curb and picked up by the City of Monterey.